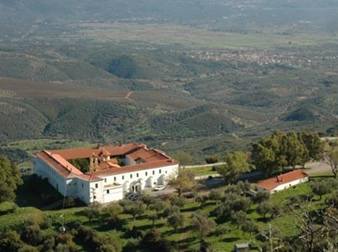 Boulkanou monastery, is dedicated to the Assumption of Mary (August 15), is built on top of Mount Ithomi, where it was in antiquity the sanctuary of Zeus Ithomata. 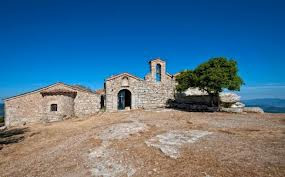 The monastery is built really on top of Ithome, on a huge rock, which gives the impression that is and foundations also. The old temple is aisled vaulted basilica-aisle today, after many modifications and has built upon the site of the temple of “Ithomata” Zeus once used boulders from it. Southeast of the monastery is the ancient temple of Zeus Ithomata. The depicted on coins of Messene statue of Zeus with thunderbolt in his right hand and eagle on the extending left leg, attaches the form also Ithomata. The Ithomi, in the middle of a large plain, even without great height (802m), gives the hill a magnificent, like it’s the highest mountain of the Messinian space. The monastery was abandoned by the monks in the 16th century, not only because the climb to the monastery was steep and difficult, but also because his position was such that the wind hitting the cold, but the sun. Slowly-slowly, they built just below the newest single Boulkanou . The monastery also guards the Holy Relics many Saints ¬ tion of churches, including St. John the Martyr Monemvassia, St. Dionysius Areopagite and Kalamata ¬ mind St. Elias Ardouni. In its rich library there are old and new books, Turkish documents and 4 sigillia of the various Patriarchs of Constantinople, who recognize or validate privileges. The Monastery Boulkanou has always been male and never stopped functioning. Today is the only androo Convent of the Holy Metropolis of Messinia. An archaeological site of Ancient Messene means that, enclosed within the fortification. Apart, that is, organized and fenced part, directly related to the Archaeological Museum, including Mount Ithomi, the citadel and the sanctuary of Zeus Ithomata near the old monastery Boulkanou or Bourkanou. Also included sacred Eileithyia-Curetes and the sanctuary of Artemis Limnatida, on the northeastern slopes of Mt. In the current village Mavromati is the ancient fountain Klepsidra that supplies water to the site today.